Previous post UpFront Mini 2015 Next post Top 5 Festivities! Get green this Halloween with our Top 5 tips! Unless you are a student it proves pretty difficult to come up with reasons to get your fancy dress on! That’s why we love Halloween so much, the best excuse all year to dress up in our most dramatic, over the top, weird and wonderful costumes and really anything goes, well that’s what we like to tell ourselves. We hope you all have some kind of spooky party to go to this weekend and if you are having your own, here are some tips for not only awesome, easy and cheap additions to the party but many of which will keep you green this Halloween. Ingredients: 12 gummy spiders, 1 rubber surgical glove, tropical fruit punch, lemon lime soda, raspberry sherbet, vodka we would imagine! 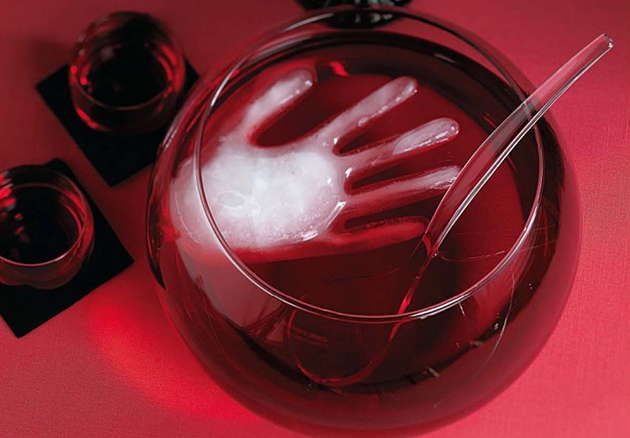 This has got to be the cheapest way to spook up your punch bowl! Make some ice cubes as normal but this time before they are set add in a gummy spider to each compartment. Fill a glove with water and freeze both the glove(s) and ice cube tray for at least 4 hours. Mix punch and soda in your bowl and then add the ice hand and spider cubes! 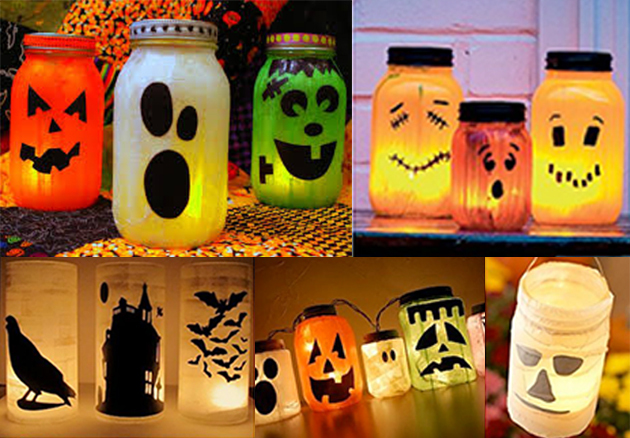 Create the perfect Halloween atmosphere for your party by getting old glass jars and get painting, drawing, cutting, sticking and tissue papering on the outside of your jar. Pop your candle or light in and you are good to go. What a great way to reuse kitchen paper rolls. Firstly paint them black and cut different shaped eyes into them. 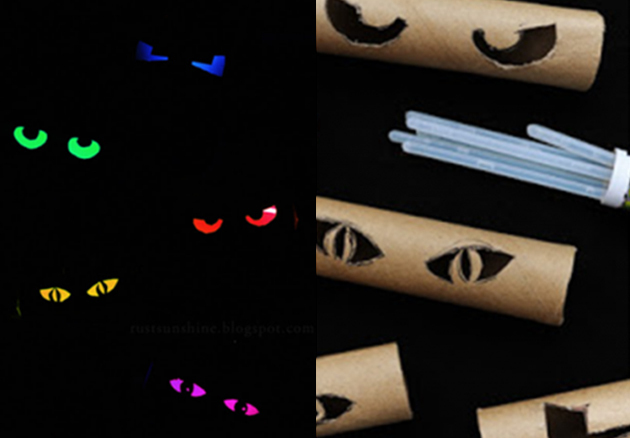 Insert different coloured glow sticks into each roll and hide them in your bushes and trees to scare any unwanted visitors away. Then I would recommend saving all you can of the pumpkin and seeds to make some delicious pumpkin soup and roasted seeds. Ok so it is highly unlikely any of you will go quite this far but I just had to throw it in for good measure. Rumour has it this was actually done within a super thrifty budget of £160. 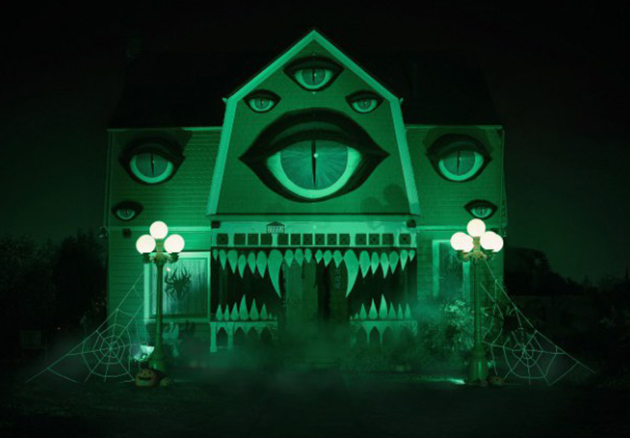 This is the work of Christine McConnell an artist based in LA who much to her parents dismay decided to transform their abode into an impressive house of eyes Halloween house. 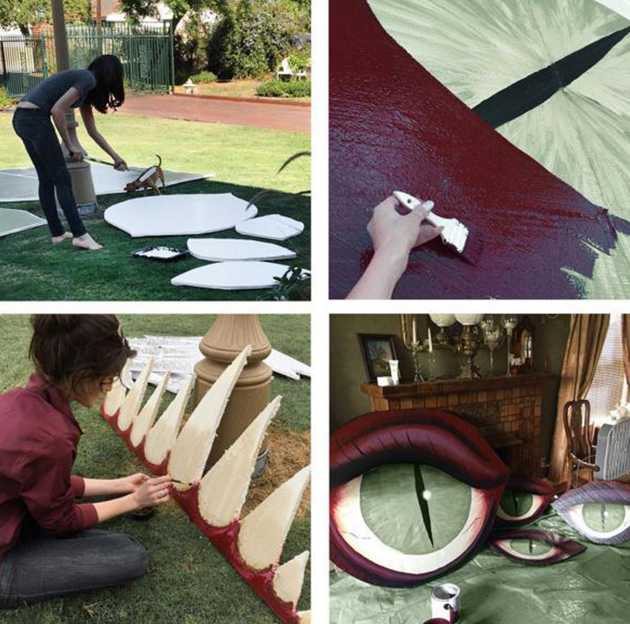 She did everything herself from cutting the boards to painting, lighting and photography. If any of you manage to get even close to this I will be extremely impressed! 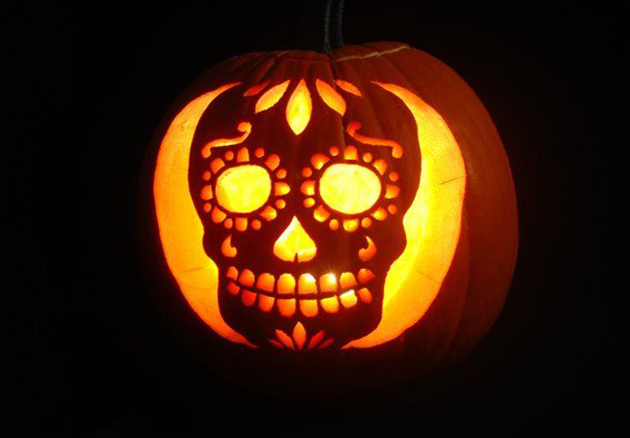 Hope you enjoyed our favourite finds this Halloween and have a great weekend!